Is your property home to multiple trees? Take a good look at where the trees are growing in your yard. If a clump of trees or even the roots of one tree are in the path of the fence, there’s an easy solution to that problem. Just slant the fence so that it doesn’t cross paths with the tree. In case the tree is on the line between your home and your neighbor’s, you might just have to exclude the tree from your side. The problem is, your neighbor might disagree with that decision. Be sure to exercise good neighbor etiquette when building your new fence. For instance, see if your neighbor would like to join you in this venture. Another option is to build your fence between the trees. The trees can help space out the fence. But if you want to follow through on this, you’ll need to inspect your trees to make sure they are healthy enough for the time being. After all, you don’t want to interfere with the tree’s ability to spread out – its trunk, roots, and branches like to extend out from the tree itself, after all. 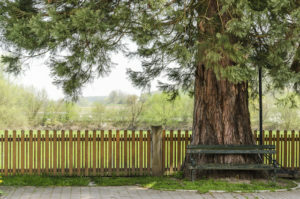 Be careful when building your fence near your tree – although it might be a charming aesthetic enhancement, relying on the tree to hold up the fence could stunt its growth. As great as these suggestions are, don’t feel too discouraged if you can’t figure out what to do with your fence if trees are in the way. You can integrate your tree into your fence, even if the tree needs room to grow and it can’t be depended on to support the fence. Just have your trees serve as interesting decoration every few feet. This entry was posted on Friday, March 30th, 2018 at 12:31 pm. Both comments and pings are currently closed.